Publication History: This article was first published as "Prediction of Well Log Interpretation Parameters" by E. R. Crain, P.Eng., 3rd Formation Evaluation Symposium, CWLS 1971, updated in 2005. This webpage version is the copyrighted intellectual property of the author. Neutron absorption in rocks is strongly influenced by the hydrogen content of the minerals. This is exploited in well logging with tools that emit neutrons and record the response to that bombardment. The response at the detector is inversely proportional to the hydrogen content of the rocks. Most hydrogen is contained in water or hydrocarbons in the pore space of the rocks, as water associated with clay minerals, or as solid forms of hydrocarbons, such as coal or kerogen. Other elements also absorb neutrons to a lesser degree, such as chlorine and iron, so some account has to be mad of the mineral composition of the rocks when assessing hydrogen content. Hydrogen content, sometimes called hydrogen index, is used as a proxy for the total porosity of a rock. The technique of measuring neutron absorption is also used in mapping of planetary bodies and moons to search for water. Anomalies on our Moon, Mars, and Mercury have hinted at possible water sources, possible boumd in minerals or in ice. Neutron logs respond primarily to hydrogen in the rocks and fluids near the logging tool. Hydrogen is present in water, oil, gas, and in the clay bound water in shale, or in water of hydration in some minerals, such as gypsum. Some other elements have a minor response, for example chlorine, but modern tool design has attempted to minimize these effects. This discussion deals first with theoretical hydrogen content of materials, then the empirical transforms needed to convert neutron response of real logging tools to apparent porosity. The number of hydrogen atoms per cubic foot of gas from the above example, held at 2,000 psia and 160 degrees F, can thus be calculated. From the composition, there are an average of 4.8 atoms of hydrogen per molecule. The hydrogen content of solids, such as coal, can be computed from an equation similar to that for liquids. The empirical chemical formula of this average coal is approximately C6H5.5, and has a molecular weight of 96. The average density is 1.45 gm/cc. Accurate data for the composition and density can be obtained from laboratory analysis and is preferable to average analysis such as this example. Since fresh water at surface conditions is defined as being 100% porosity and has a hydrogen concentration of 18.83 * 10 ^ 26 atoms/cuft the apparent porosity of other hydrogen-bearing substances can be calculated by direct proportion. Neutron porosity values determined from hydrogen content are also additive. This is a rather empirical approach to the problem, but it does give some idea of the amount of apparent porosity to expect, provided other neutron absorbers are absent or negligible. Thermal neutron response in solids and fluids are related to a parameter called the diffusion length. 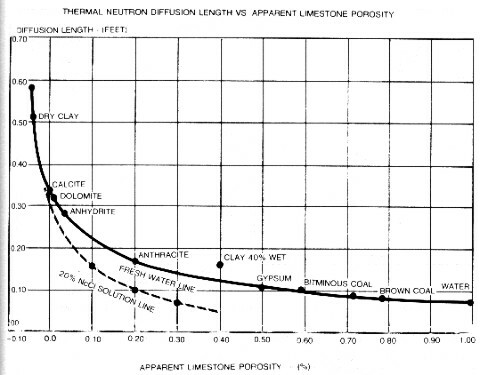 The apparent limestone porosity of a rock versus diffusion length for thermal neutron logs of average intensity, is plotted below. It has been redrawn from "Radioactive Investigation of Oil and Gas Wells", translated from the Russian version by J. C. H. Muhlhaus, MacMillan Company, 1965. Cross section values and summaries of data may be found in "Handbook of Physical Constants" edited by S.P. Clark, Geological Society of America, New York, 1966 and in the tables at the end of this Chapter. Calculate the diffusion length of the bituminous coal of the earlier example from its elemental values. This agrees closely with values given in tables and represents 65% apparent porosity on the chart in the graph above. This compares with an apparent neutron log porosity of 74% found earlier for this coal by the hydrogen concentration method. Since the graph is rather flat in this region, the difference is not too hard to understand. As well, the chart only applies to one particular theoretical tool. The response curve for each real logging tool varies considerably from this ideal case. This approach is described in full in "Radioactive Investigations of Oil and Gas Wells", translated by J. O. H. Muhlhaus, MacMillan Company, 1965. There are three basic neutron logging instruments with a chemical neutron source. Each instrument is classified according to the energy level of the detected particles. Fast neutrons are neutrons with energies greater than 100 KeV; epithermal neutrons have energies between 0.025 eV and 100 KeV; thermal neutrons have an energy of approximately 0.025 eV (at 25 C). 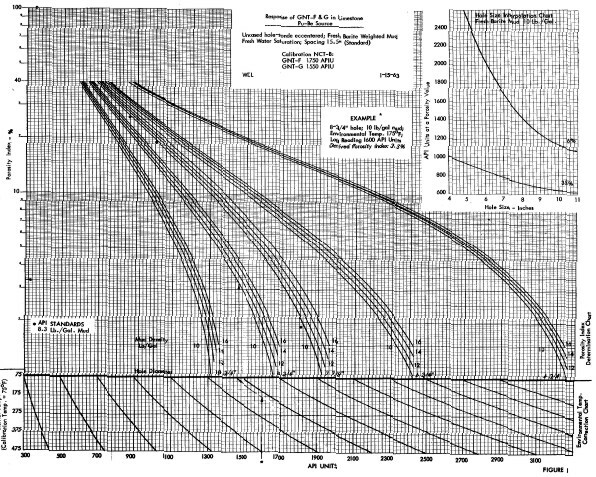 The gamma ray neutron log (GRN, now obsolete) measured gamma rays caused by capture of the emitted neutrons by hydrogen in the rocks. 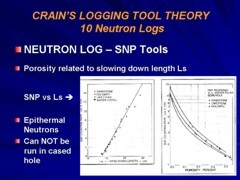 The sidewall neutron porosity log (SNP) measures epithermal neutron response and the compensated neutron log (CNL) responds to thermal neutrons. Both have neutron detectors instead of the gamma ray detector of the obsolete GRN tool. Some current CNL tools have detectors for both thermal and epithermal neutrons, using a single neutron source centered between the two detector sets. A fourth type of tool uses an miniaturized electronic particle accelerator as a source of neutrons, instead of the chemical source. Commonly called an integrated porosity log (IPL), it responds to thermal neutrons. A fifth type uses the particle accelerator as a source of pulsed neutrons and is discussed in another Section of this Handbook. These logs have been widely used in cased holes to determine porosity and water saturation, usually called pulsed neutron logs (PNL) or thermal decay time logs (TDT). Determining the neutron response to porosity (as indicated by hydrogen content) for a real SNP or CNL tool is accomplished by finding a one-to-one correspondence between each tool's basic measurement (counting rate for the SNP tool or ratio of near and far count rates for the dual detector CNL tool) and some attribute of the rock, preferably related to porosity. A suitable attribute is the neutron slowing down length (Ls) for the SNP tool, and migration length (Lm) for the CNL tool. The slowing down length is defined as the square root of one-sixth the mean square crow-flight distance the neutron travels in slowing down from the source energy to epithermal energy. The earliest neutron logging system, producing a neutron - gamma (N – G) response, is sensitive to capture gamma rays emitted upon absorption of thermal neutrons by atomic nuclei of the elements in the rock. This class of logging tool, often called gamma-ray neutron log or GRN log, is represented by older, single detector equipment. Porosity response is inversely proportional to diffusion length (Ld) - the distance that it takes neutrons to lose enough energy to be captured. The emitted neutrons come from a radium – beryllium or an americium – beryllium source. Radium and americium are natural alpha particle emitters and the alphas eject fast neutrons from the beryllium. With its 433 year half life, the AmBe source output is considered very stable. Approximately 40 x 10^7 neutrons/sec at 4.5 MeV average energy are emitted by the source. When the neutrons are sufficiently slowed down by collisions with the rock, they are captured by the nuclei and a high energy gamma ray of capture is emitted. The gamma ray count rate at the detector is inversely proportional to the hydrogen content of the formation, in a semi-logarithmic relationship. Detectors were Geiger-Mueller gamma ray counters. 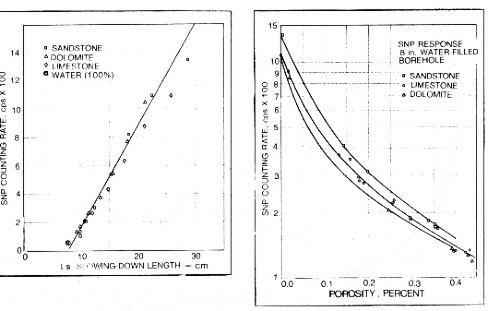 Transform of count rate to porosity were performed manually using graphs similar to the image at the right. The source to detector spacing on the older tools was 15.5 inches, giving good statistical accuracy. Longer 18.5” spacing tools became popular because they were more sensitive to porosity but suffered from higher statistical variations. These tools are obsolete and no longer available, but many thousands exist in well files waiting for the serious petrophysicist to use for finding bypassed oil and gas. A large number of charts for specific tools, spacings, borehole conditions and rock types were available from service companies, such as the one shown below. These may no longer be easily found today, and the semi-logarithmic approach described below works well except in very low porosity. Sidewall neutron porosity logs (SNP) and some fullbore compensated neutron logs respond to epithermal neutrons. These are described genericallu as neutron - epithermal (N – EN) devices. The description below pertains specifically to the SNP. The graph below shows the relationship between count rates at the detector of a sidewall neutron porosity (SNP) tool and porosity for the three primary lithologies. These results were obtained in the laboratory with quarried rock samples, and constitute the basic data for calibrating the tool in terms of porosity. Also shown above is the same count rate data plotted against the calculated slowing down length Ls. A linear best fit is used to describe the correspondence between count rates and slowing down length. At low porosities, there is some lithological effect. Different rocks with the same count rate have different slowing down lengths. Also for some reason, the water point does not fit the line. Fortunately this is not serious as logs are seldom run in zones with more than 45% water. If we know, or can calculate, the slowing down length for neutrons of epithermal energy, in particular rocks, such as calculated in the previous Section, we can enter this value in the graph above and obtain the apparent porosity reading for a real SNP type tool. Most neutron logs run today are compensated neutron logs that respond to thermal neutrons. These are described generically as neutron - neutron (N – N) devices. Porosity is best characterized by the ratio between near and far detector count rates. The upper graph at right shows the relationship between near and far detector thermal neutron count rate ratio versus porosity for the three primary minerals, the data again being made in laboratory formations. The middle graph shows the same ratio data plotted against calculated migration length - Lm. The fit is excellent and even takes in the water point. Again the migration length of an arbitrary mineral or mixture of minerals can be entered into the graph to obtain the apparent porosity reading for a real thermal neutron CNL type tool. Note that real tools may use function formers or computer algorithms to modify the apparent tool response. This is shown for the 1970'x vintage Schlumberger CNL tool in the bottom graph. Considerable computer modeling of neutron response by service companies has generated numerous revisions of these response curves. Most of the effort has been directed at producing a linear porosity scale in all lithologies. Consult specific service company chartbooks for the era and tool designation. Most petrophysical analysis programs use a generic lithology correction. Some perform corrections for a specific, but unknown, tool design that may be inappropriate for the the tool under investigation. Still others offer many tool options, but not all possible tools will be listed. The generic transforms are usually sufficient for typical petrophysical analysis, except in very hot, very salty mud systems, where accurate corrections may be needed. In clays, micas, and zeolites, the apparent CNL porosity is consistently higher than the SNP porosity. As a result, the CNL measurement shows higher porosities in shales than the SNP or epithermal CNL tools. The explanation for this effect is that the epithermal tool responds only to the slowing down of the neutrons by hydrogen atoms, whereas the thermal CNL measurement is also affected by the neutron capture process, since the tool measures both thermal and epithermal neutrons.